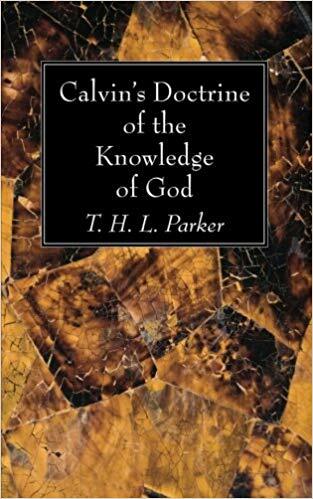 T. H. L. Parker, Calvin’s Doctrine of the Knowledge of God (Eerdmans, 1952; Wipf and Stock reprint, 2015): 128 pp. This essay consists of two parts. Part One is on “The Knowledge of the Creator” and Part Two on “The Knowledge of the Redeemer.” This reflects the design of the opening two books of the Institutes, since “The first books deals with the knowledge of the Creator; the second with the Knowledge of the Redeemer” (2). For Parker, the Institutes is the “chief source for our understanding Calvin’s doctrine of the Knowledge of God” (3). Parker begins by contrasting the beginnings of Calvin’s Institutes and Thomas Aquinas’s Summa Theologica and his famous five proofs for the existence of God. “Calvin, however, presupposes the existence of God, on the very ground, the validity of which St. Thomas denies, that men have an innate knowledge of the existence of God” (7). For Calvin all men have a sensus divinitas. “All men, even atheists, the grossly wicked and the complacent bourgeois, know that there is a God” (8). Thus, he does not need to argue for God’s existence. “The problem of the Knowledge of God is the problem of revelation” (13). God reveals himself in the opera Dei, the works of God, “by which Calvin means all the creative and providential activity of God” (14). Parker: “We shall be disappointed if we look for disparagement of man in the pages of Calvin” (16). “For Calvin the creation has no meaning in itself, apart from the Creator” (17). “The universe is a mirror in which is to be seen the effigies Dei, the portrait of God…. Thus, in creating the universe God made it a representation of himself” (18). “For Calvin, history—public and private—is not a confused miscellany of events and actions” (21). “Man in his created state of purity was capable of the knowledge of God…. But such a soul and mind ceased when Adam fell” (27). “When the seed of religion is cherished man is not led by it to the true worship of God, but into superstition or idolatry…. In this lies the abuse of the sensus divinitatis” (31). “Although the universe does show forth God’s glory, man is too blind to see it” (35). Thus the oracula Dei (as Calvin was fond of calling the Scriptures) are necessary to the understanding of the opera Dei” (39). “Calvin tells us, on the basis of the Biblical witness, that the faculty of perceiving the Creator in His works is not merely impaired, but lost; that man is not suffering from bad eyesight, but from total blindness” (39). Parker says Calvin’s “Rational Proofs to Confirm Belief in the Scriptures” (Inst. 1.8) “collectively constitute a blemish on Calvin’s doctrine of the Word of God which has had for its progeny the busyness of fundamentalists to prove the truth of the bible to the neglect of discovering and preaching the Truth of the Bible” (43)! Parker cites Peter Barth calling the Institutes “Calvin’s forefinger, pointing to the Scriptures” (45). “Therefore, he regards the Scriptures as a school, the Holy Spirit as a schoolmaster, and believers as the pupils” (46-47). “The Scripture is a thread, guiding us though the labyrinth, the enigma of the universe in which we live” (48). “The oracula Dei both confirm the opera Dei and in turn are confirmed by them” (51). Parker begins with Calvin’s “perfectly orthodox” view of the Trinity from the first edition of the Institutes (61). He also notes that “Calvin’s knowledge of patristic theology was not extensive” (61) and that “new quotations from the Fathers” were “being continually added” to succeeding editions of the Institutes (62). The 1536 edition “is not remarkable for its dependence on the past. Only 5 Fathers are directly cited: Ambrose (once), Augustine (ten times), Jerome, Sozomenus and Tertullian (one each)” (62, n. 3). “The identification of Jesus of Nazareth with the eternal Word of God, made by faith on the authority of the Scriptural witness, means that He is regarded as the valid revelation of God” (70). “Jesus of Nazareth is the revelation of God” (74). “For Christ is called the image of God on this ground, that He makes God, in a manner, visible to us” (75). “Calvin thus regards the death of Christ as the summa, the intensive focal point, of His life, and hence places the emphasis upon it, but comprehending and not excluding the rest of His life and actions” (86). “We are not saved by contemplating Christ from a distance, but by being united with Him…” (91). “For Thomism, the knowledge of God is a part of epistemology; i.e., it is a part of our general knowledge and differs from other sorts of knowledge in that its object is different. For Calvin, however, the knowing itself differs from general knowing” (101, n. 3). “There is, then, according to Calvin, a certain knowledge which precedes and begets faith; which is indeed a praeparatio fidei” (102). “The knowledge of God cannot be regarded as one of the branches of epistemology, but differs fundamentally from all other forms of knowing” (106). “Knowing God is a unique activity in man’s experience, having its own categories” (106). “The fall, for the Thomists (although by making a closer connection between the nature of man and the dona superaddita than the Scotists, they were committed to holding that the loss of the one meant at least the impairing of the other) was not the irreparable cataclysm of human nature that it was for the Reformers. Whatever qualifications are made, the final Thomist word is that man’s soul is wounded, but not dead” (107). On the debate as to whether Calvin held the analogia entis, see 109 ff. “…Calvin admits a certain likeness between the mind of man and the mind of God” (109). “Calvin does not use this likeness between God and man in the way that Thomism and Calvinism do” (110). Man has not lost his “natural endowments” but his “supernatural endowments” (111). Finally, the book has an Appendix: a book review of E. A. Downey, The Knowledge of God in Calvin’s Theology (1952). “There can be no doubt that Calvin must be cleared of any charge of being a natural theologian, or of having an ‘apologetic’ programme” (125).